The Anaconda is one of two Mercenary TAGs, normally only available to Merovingians and Druze Bayram Security, but can also be used with the Soldiers of Fortune ITS Extra. If you're looking for something big and nasty to put on the table, and on a budget, this warrants looking at. Not the swiftest tag, clocking in at MOV 4-4, but otherwise the Anaconda is pretty respectable. BS13, ARM/BTS 6 are all fairly standard for a budget TAG, it is a competent gun fighter, and pretty tough to damage with small arms. 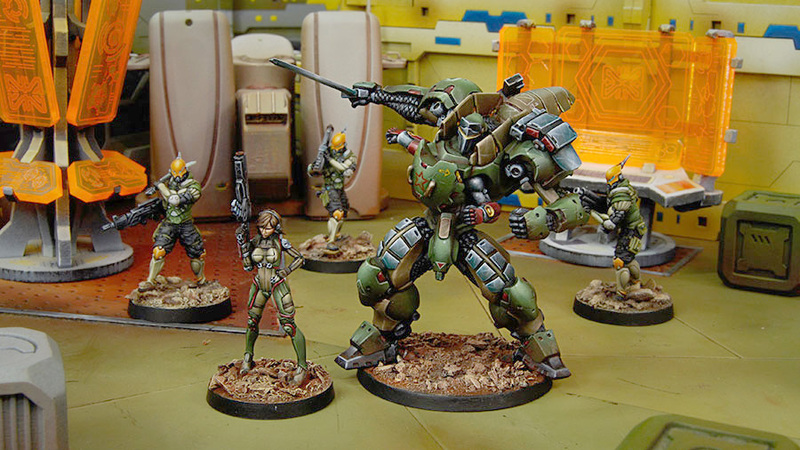 Aside from being a bog standard manned TAG, the Anaconda also has Courage, which can be helpful from time to time, keeping you from dropping suppressive fire, or otherwise having more control over the unit while you're playing. While it is a Manned TAG, it is well worth noting that the Anaconda carries an Operator, not a Pilot. This may seem like a minor distinction, but it can make a big impact. Should the TAG get destroyed, and the Pilot survives, the Pilot will remain on the table, and generate orders. Additionally, points for killing the TAG aren't granted unless the Operator is also slain. The Escape System will help keep your Operator alive the turn the TAG goes down, when the TAG dies, you place the Operator in base contact, remove the TAG, and place a Smoke Marker in it's place. So long as the enemy isn't covering the Operator with MSV2, there is a pretty good chance it will survive until you can move it to safety. It's also worth noting that the Anaconda Operator carries with her a Spitfire, and has BS12, so even after the TAG goes down, the Operator can carry on with some decent firepower. Spitfire + Light Flamethrower, Panzerfaust. The basic equipment of the Anaconda gives it a variety of options for handling different range bands. Enemies further away are at risk of eating a Panzerfaust, while from 8-24" the Spitfire will take over, and should something get too close, you can torch it with the Light Flamethrower. With this profile, I would focus on moving the Anaconda up the board, firing as you walk up, until you can get in a good position to go suppressive. HMG + Chain-colt, Panzerfaust. A recent addition to the Anaconda, it can now exchange it's Spitfire + Light Flamethrower for a HMG + Chain-colt. When taking this profile, you give up the +3 range band from 8-16", but the reach of your primary weapon is extended considerably. There is generally little difference between the Chain-colt and the Light Flamethrower, though obviously having Fire ammo is nice. The nicest thing about this profile is that it is more comfortable hanging back, where it can be repaired should it take damage, and would probably leave it's Operator in a safer position. Despite being a TAG, it is vulnerable to being damage, after taking 2 STR, it will self-destruct, leaving only it's Operator. So like the Iguana for Nomads, you do need to be careful with what kind of engagements it ends up in. Keep it clear of enemy HMGs, and maintain cover whenever possible. For it's cost though it does carry a good assortment of equipment. If surviving/killing army points isn't an objective, don't be afraid to get the Operator stuck in after the Anaconda itself goes down, she carries that Spitfire for a reason! There is potential use here as a DataTracker in some missions. The DataTracker status will pass to the Operator, should the TAG itself be destroyed, and since the Operator is S2, she can be easy to hide. It obviously has guns made for killing enemies, so where an offensive dataTracker is required, it can do the trick. I wouldn't however use it as the DataTracker in missions where extra points are awarded for killing the enemy DataTracker, being a TAG it has a big enough target on it's head already. Here's my very own Anaconda with HMG + Chain-colt conversion.